When it comes to endurance, perseverance and overcoming hurdles, I’d never put learning the violin in the same category as marathon running but that’s all changed. As much as I love my violin, it is also hard work, endurance, perseverance. Never giving up. Just like new babies look so sweet but makes some truly dreadful sounds, my violin also has its own theme and variations of the “witching hour” something akin to a Tom cat howling at the moon while being grabbed by the throat. Two years ago, I took up the violin by default. I’d had no dreams, aspirations or even vague thoughts of taking up an instrument midlife. I didn’t like music. Didn’t even listen to music. I was a writer, a photographer and music interfered with my thoughts. It was at best distracting but mostly annoying. Turn it down. Switch it off. Although much of my family is incredibly and even professionally musical, I was musically stunted…the runt…despite many, many years of piano lessons. Anyway, my daughter has always shown a strong love of music and when she started school, the big moment of choosing an instrument finally came. I was all set for her to start off on the piano but she wanted to learn violin. Was quite insistant on the violin. I wondered if she felt some kind of special connection with it and decided, against my own council, to let her have a go. When we arrived at her lesson, the teacher said I could sit in and it soon became apparent that I needed to be more than just a taxi driver. She needed hands on encouragement. We pulled Geoff’s grandfather’s violin out of the cupboard and I joined in on her lessons. I didn’t know it at the time but Suzuki actually believed the mother should learn the violin first in order to encourage the child and I was unknowingly following in his footsteps. I actually had some background with the violin. My brother had learned Suzuki violin for many years and had actually performed at the Opera House a number of times at annual concerts. I had learned for a couple of terms but had abandoned violin in disgust when I couldn’t hold the bow properly. So whilst I couldn’t remember much about playing the violin, I wasn’t a rank beginner and could actually help. Miss and I practiced well together through term one but after not practicing during the holidays, she sounded terrible when we went back to lessons. She had a few colossal meltdowns and I decided to keep her spot warm until she was fit to return. I never doubted her love for the violin. She just needed a bit of a break. Another term went by and by this stage, I had fallen in love with the violin, despite all its quirks and difficulties. I read that it took 10,000 hours of practice to become a concert violinist and worked out that it would take something like 28 years at one hour a day and I joked about making my concert debut at the Opera House using a walking frame. Meanwhile, our musical school put together a violin ensemble and we performed at the end of year concert at Lizotte’s, a local rock n’ roll venue. 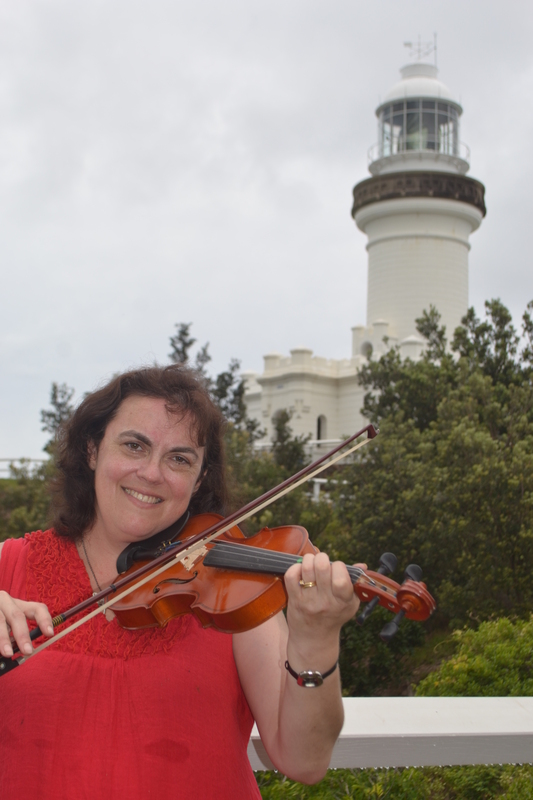 January, I packed up my violin when we headed to Byron Bay and had Geoff photograph me playing outside the iconic Byron Bay Lighthouse. Well, I wasn’t actually playing. Just posing. I wanted the shot. While I still had my heart set on my debut as a concert violinist, I first had to sit for my preliminary exam. This is the first and most basic exam and to be perfectly honest, you usually sit for your preliminary exam at the tender age of something like 5 maybe 6 years old…not 44! To further put the pressure on, I had scored an A in my preliminary piano exam when I was around that age and I couldn’t recall doing a lot of practice. Therefore, logic argued that I should easily score an A as a more mature violinist who had actually bothered to practice. That is practice for at least 30 minutes every day and not just under duress. However, as I said, the violin’s middle name is perseverance. While preliminary should have been easy, a piece of cake and my “A” almost automatic, it was actually hard work. I really struggled to get a true and pure sound without even the faintest squeak creeping in. In a real act of contrariness, my violin would play two strings when I only wanted to play one but when I was trying to play two strings simultaneously for double stops, I would only play one. Infuriating! Yet, at the same time, my violin was teaching me so much more than just how to make music. It was teaching me how to stick at something I found difficult and to keep practicing and practising until I got it right, instead of simply giving up at the first sign of trouble. That was a huge leap forward for me. When I couldn’t do something in the past, I’d simply say it wasn’t me and give up. “I couldn’t do it” but now I had the example that if I really wanted to do something and if I put the hours in, I could probably do it or perhaps I could find around my hurdles. 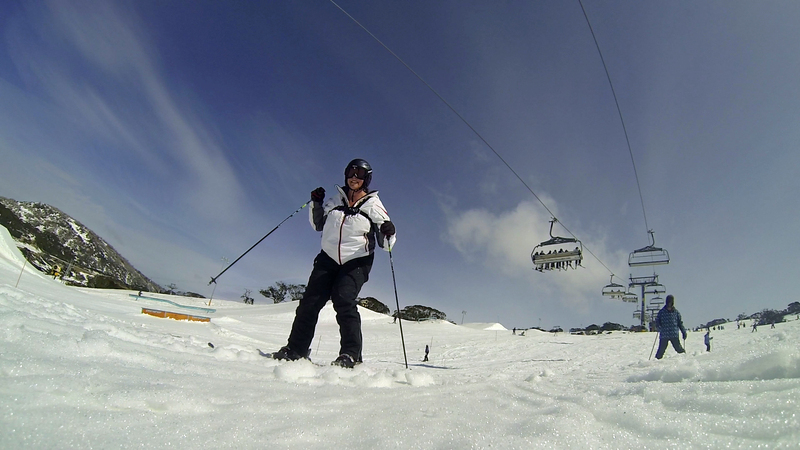 Here I am skiing at Perisher. I really put this into action on the ski slopes when I found the whole skiing experience quite overwhelming. I remember sitting on the chairlift which I really, really loved wondering why I was putting myself through the stress of learning how to ski when sitting on the chairlift was so much fun and so effortless. Yet, at the same time, I found the challenge invigorating and it was great to learn a new skill and improve. As I was tackling the mountain, I reflected on how perseverance and practice had worked for the violin and these principles would also apply to skiing. I had private lessons with my instructor and practiced inbetween and I really started to improve. I become a skier. I was immensely proud and when we arrived home, I was really chuffed to hear my son tell the Deputy Principal that Mummy had gone skiing even though she was afraid. That hopeful told him volumes. Getting back to my violin, I was working towards my exam and the end of year concert when I developed pneumonia and spent 3 weeks in bed. No practice. My auto-immune disease had also flared up and I lacked the muscle strength to hold up my violin. The first day I returned to ensemble practice, I made a zillion mistakes and it sounded like cat claws traversing the strings. It was disgusting and soul destroying. I wondered whether it was all just too hard. That trying to learn the violin while battling a life-threatening illness was all too much. Was I pushing myself too hard? Should I just relax and fall into the easy chair and stop? You know what it’s like when you’re down on the ground and you are facing that fork in the road. Should I keep fighting or just quietly let go of the dream? My Dad mentioned something about it being good to have goals but what was the point if I couldn’t breathe? I was still coughing and coughing and coughing…the pneumonia leaving a nasty legacy. Still, I was slowly improving. Practicing again and as yet, we hadn’t received any notification of my exam date. That probably meant I had a good 3-4 weeks of practice up my sleeve. I hadn’t given up yet. Then the date arrived and I was scheduled to be at the AMEB offices in Sydney at 9.15am. I live about 2 hours away and I couldn’t see how I was going to get there. While this could have been a sign to withdraw, instead I wrote a letter asking for my exam to be moved to Gosford. Mentioned my health and disability issues and was given special consideration and my time moved to 2.55PM. After this kindness, I felt I had to front up…even if I failed! My violin and I caught the train down to Sydney and I had lunch in the park watching the Ibis prey upon hapless office workers. As much as I love my trips to Sydney, I couldn’t relax. I turned up to my exam half an hour early. There is a practice room but apparently this is only for tuning your instrument. I had left home early so I could warm up and I needed at least a thirty minute practice beforehand. My body doesn’t work well at the best of times. 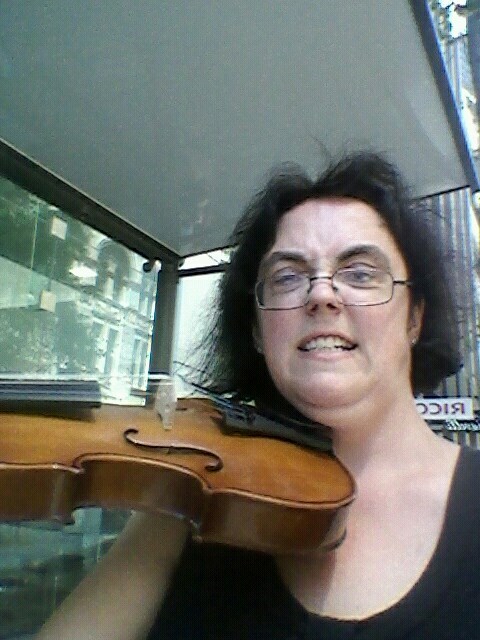 A selfie of me playing my violin in the bus shelter, Sydney. My violin and I exited stage left. There we were on Clarence Street in the heart of Sydney looking for somewhere, anywhere, that I could practice my violin with even just a modicum of privacy. Office workers were rushing back and forwards and lanes of traffic crawled past. I investigated a few brick walls outside a couple of pubs but then spotted the bus shelter outside the AMEB building and set myself up. I know that any decent musician would have been too self-conscious to play but I was desperate. I had to get my fingers moving. My teacher had emphasised long, smooth bow strokes and I tried to picture her long, flowing blond hair moving slowly through the water like a mermaid. It seemed to work, even surprising myself. I was quite impressed and thought that at last I had finally “got it”. Not on your life. I wasn’t overly nervous about the exam but at the same time, I knew I made many mistakes. I just wasn’t comfortable and that’s the hard thing about the violin. When you stiffen up, your bowing goes jerky. Your fingers don’t move properly and I was mixing up C and C sharp. I just wanted to escape. I told my teacher that I thought I’d got a C but harboured fears that there was also scope for a D.
Fortunately, the results were due out after Christmas and so I could get through Christmas lunch and not feel I’d brought total disrepute on the family. I was always so proud of my goals and so determined to achieve them but what with the pneumonia and my auto-immune disease playing up, I figured that it was okay to fail. Walk away. Focus on my writing. Be a writer. After all, that’s who and what I really am. The violin was only second fiddle and certainly not worth dying for. Well, the results didn’t wait until after Christmas. I received a very nice, very surprising early Christmas present…an A! I couldn’t believe it and re-read my teacher’s email several times before I believed it. Perseverance did pay off after all! This entry was posted in Health, Violin and tagged auto-immune disease, chronic health, concert, exam, goals, growth, music, musical instrument, parenting, perseverance, piano, success, violin on December 30, 2013 by Rowena. There comes a time when even the most stubborn and resistant soul finally sees the light. About 8 years ago, my hairdressing friend first broached the subject of cutting my hair short. Experiencing severe chest pain, chronic shortness of breath and blackouts, I almost leaped out of the chair and was well and truly doing the Harold Holt down the street and was halfway home when she finally caught up with me wielding her snippers, of course. Instantly, I knew how the three blind mice felt being chased by that mad farmer’s wife with the knife. She wasn’t about to cut off my ponytail. No way! It was me…an inextricable part of myself and all that I am. I had beautiful long, dark hair…my crowning glory. I’d be naked without my hair…denuded. There was no way on this earth that I was ever going to cut my hair short and she wasn’t going to do it either! No doubt, my friend observed these tell tale signs of shock as I gasped and struggled to regain my composure. However, this only fuelled her determination: “When a woman turns 40, she needs to cut her hair.” I don’t recall her exact words but she also mentioned something about needing to lift your face, which along with all your other body parts, was also heading permanently south. While this all seemed like very sound advice, I was still a youthful 36 at the time and all this talk seemed very premature. Turning forty was a very, very distant shore. Although I’m what you would describe as “deep”, even I have to concede that your hair is more than just a superficial mat stuck on top of your head. To some extent, it reflects your personality, values and beliefs and if you have ever known anybody outside the hairdressing fraternity who changes their hair colour like the rest of us change their underwear, it can also be quite an effective litmus test on the mental health front as well. When people make big changes in their life, it is no coincidence that they often change their hair. High school teachers often pick a new style as the first sign of coming “trouble”. I turned 40 and somehow managed to dodge the snippers, although my hair was shorter and for some reason had also gone wavy if not outright curly. That was a bit of a surprise as I’d always had close to dead straight hair. There were no complaints, however. I was mystified but delighted. No doubt there are some who are confused but the way I see the world, there are short-haired people and long haired people just like there are cat and dog people and a firm line in between. That makes me a long-haired person. I’ve had long hair virtually all my life aside from a very bad hair stage at school in the mid-eighties where some kind of madness hit and I emerged from the hairdresser with a permed bob with an undercut. I thought I was the personification of cool until my hair bleached in the sun and turned orange. Then things went from bad to catastrophic as heartache followed heartache and in bouts of teenaged angst, I cut my hair shorter and shorter in acts of cathartic release. My hair has never been permed or short ever again! of a sudden all that hair felt like a burden, an unwanted nuisance and it had to go. I walked into the hairdresser, walked out with my new short hair and I haven’t looked back. I feel quite liberated. There was just one thing about my new hair that blew me away. It was straight. Talk about a blast from the past. I couldn’t wait to get home to fluff it up again. Short was fine but I’m too quirky to be straight. PS The kids had quite surprise when I picked them up from school with my new short, straight hair. Mister really didn’t like it and practically said it was yuck and Miss was initially quite positive but has since said that she couldn’t find me and has concerns about how to find me after school now. This new hair isn’t Mummy yet. Geoff is also getting used to it. 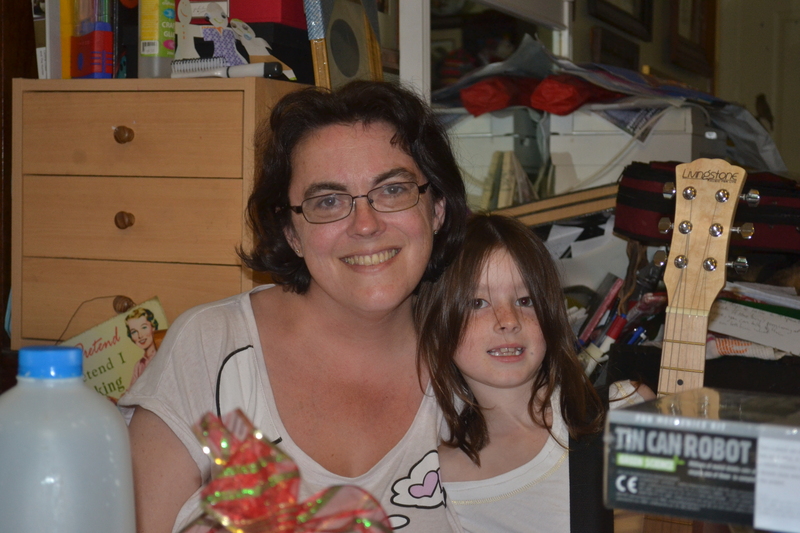 This entry was posted in Uncategorized and tagged beauty, Change, growing old, haircut, hairdressing, identity, personal development, turning 40 on December 28, 2013 by Rowena.